Our ultimate 7 Nights/ 8 Days package staying at 5 star Hilton Queenstown. You will pick up your hire car from the airport which you will have for the duration of your stay. 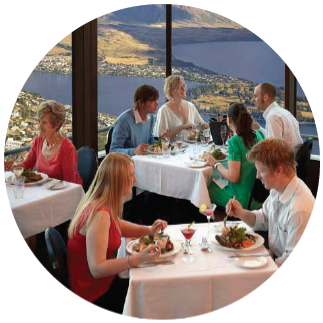 A delicious hot and cold breakfast will be served daily at the Wakatipu Grill, inside the Hilton Hotel. Playing 18 holes at 4 courses including Millbrook, Jacks Point, Arrowtown and Kelvin Heights. Add in a Wine Tour at Gibbston Valley Winery, Spirit of Queenstown Lake Cruise, dinner at the top of the Gondola and, to finish it off, a jet boating experience like no other with leading jet boat company K Jet. 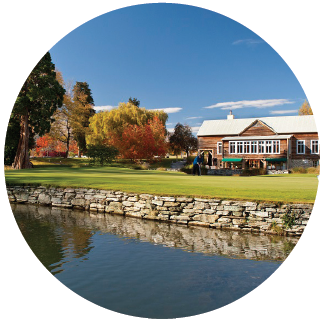 Arrowtown - The picturesque Arrowtown Golf Club is set in one of New Zealand’s most historic and scenic regions. This Golf Course is a must when playing golf in Queenstown. Surrounded by mountains the 18 hole course has superb views from every fairway. 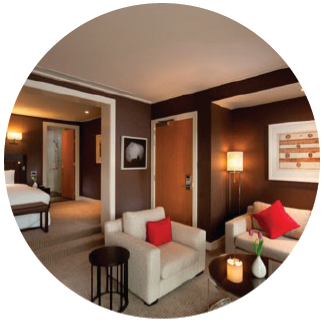 Elegantly appointed and beautiful Guest Rooms are spacious and air-conditioned. The contemporary alpine décor, schist fire place and lounge suite creates a comfortable and warm retreat and the floor-to-ceiling windows, and private balcony ensure abundant natural light. Guest Rooms have generous floor space and a split level floor design separating the bed and living area. Rooms include a work desk with telephone and high speed internet connection, large LCD TV, a mini bar and tea and coffee making facilities. Floor to ceiling windows let in ample light and maximise village or mountain views. The serene bathroom offers two basins, separate bath and walk in shower with high performance rain head shower and luxurious Peter Thomas Roth amenities. A great night’s sleep is guaranteed in your king-size Hilton Serenity bed. You can step onto a big yellow K Jet every hour at the Main Town Pier in the centre of Queenstown. In an unforgettable New Zealand Jet boat experience you’ll be transported from the sophisticated downtown area into the channels of two of New Zealand’s most scenic rivers. Across the pristine waters of Lake Wakatipu and through the tranquil beauty of the willow lined Kawarau River, the Jet boat then speeds into the shallow, fastmoving braids of the Shotover River. Breakfast at the Wakatipu Grill - a delicious hot and cold breakfast will be served daily at the Wakatipu Grill, inside the Hilton Hotel.